Bashar Alaeddin, a Jordanian photographer and videographer, is inspired by a fusion of culture, the silvery mystery of star patterns and astrology, and linguistic heritage. 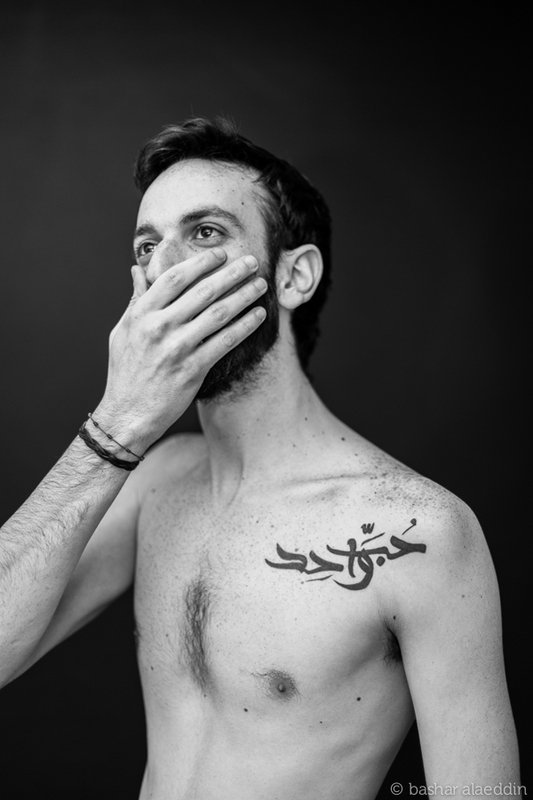 One of his latest projects, entitled Arab Ink, tells the visual narrative of people who used Arabic in a permanent form on their bodies to tell a story, to honor someone they love, or to mark an important part or moment of their lives. 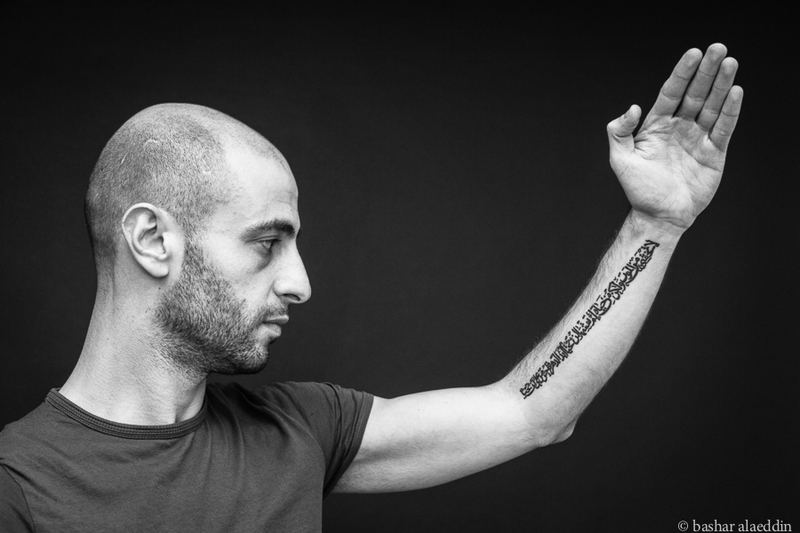 We talked to Bashar about the significance of this project and it’s ability to transform the way we think about tattoos as taboos into art forms celebrating the complexities of our language and culture. 1) When did the Arab Ink project start? Arab Ink started in the summer of 2013 as an idea I got while walking through the graffiti-filled streets of Beirut. It came to me initially while admiring the Arabic typography and saw one that was similar to a tattoo a friend of mine got. I began thinking of working on my first ever extensive photo-documentary project. 2) How did the idea come to you? I’ve worked most of my photography career in advertising and commercial work and was, at that time, trying to step away from that and start my first proper photo-documentary project. 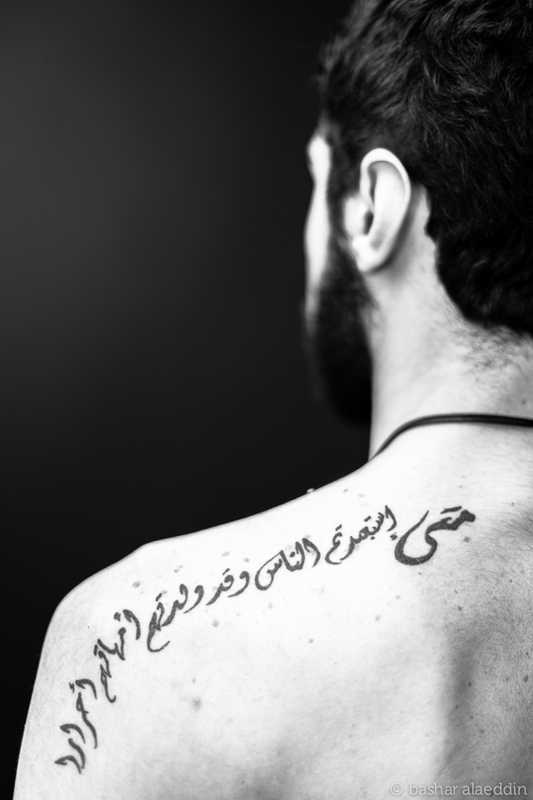 I’ve been intrigued by tattoos and as an avid obsessor with the Arabic language and it’s calligraphy art forms, I decided to combine the two and document the Arabic tattoos since also, there’s never been quite enough information on the topic. 3) Where do you hope to get funding from to continue the project? Right now, honestly I have no idea. My preference would be to crowdfund it through one of the crowdsourcing sites online however I’m still trying to figure out the logistics of payments, rewards, and how to market it professionally. My other option would be to get exclusive funding from a gallery that would hold the opening night and assist me in publishing a book the final stages of the project. As of now, I’m split between the two and which to focus on. Hopefully I’ll make my decision by summer 2015. 4) What is your goal with the project? The goal initially was to make a black and white photography fine art book that would showcase over 100 hundred photographs and the stories behind them. As the project progressed and along with the immense positive feedback I’ve been receiving, it’s now going to be a massive database style website with my photographs, user-submitted photographs, interviews with calligraphers and designers, information on where tattoo parlors are in the Middle East, contact information and even partnerships with calligraphers who give workshops and educational material on the history and style of the Arabic language. There are a lot of things written in my notes about what it is and what it will be. Alongside that as well will be an exhibition, a book and even as far off to make a 2nd edition book since this is something that I don’t think will end. More content and images will be constantly added over time and will hopefully just keep going. 5) How can people contact you if they are interested in participating? There are a lot of people who are listed yet to be photographed — in Cairo, Beirut, Dubai and even as far as Brazil and Australia. Right now, I am still working on the funding aspect; on how to get to them or even send them tickets to come to Amman for a night or two. 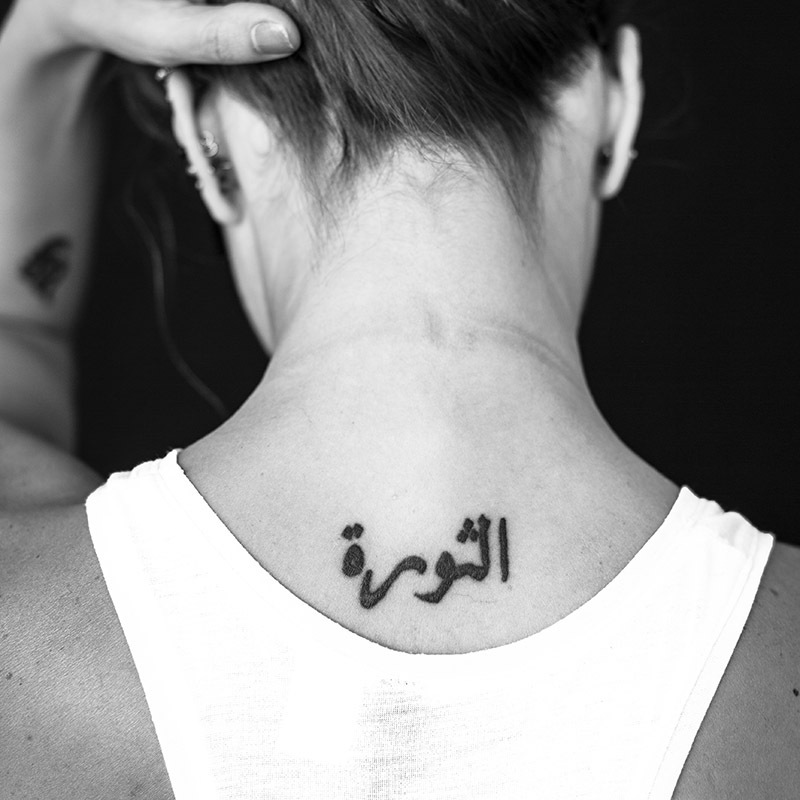 For more information: Check out Arab Ink’s official project site, and the Instagram account of the project @ArabInk, and email Bashar (bashar@arabink.me) if you are interested in being photographed and sharing your Arabic tattoo.